holding the four winds of the earth…. This above passage from Revelation 7, concerning the four winds, is generally not understood by the vast majority of today’s theologians and Bible teachers. Well, for one thing, most evangelicals have been told that they will be Raptured away from earth prior to the unfolding of Revelation. Nevertheless, there are some biblical insights that can be offered. All through the growing process, the precious wheat kernel was held safely in its housing, until the time of harvest. But at harvest time, the wheat kernel must be separated from its housing. And so, when the strong winds begin to blow, a process known as winnowing is implemented by the farmer. In this process, the wheat is tossed into the windy air, and the separated because the lighter chaff is carried away with the wind, while the kernels fall to the ground. In God’s infinite wisdom, he has created all these things to teach an object lesson about the great harvest which is just beginning. Yes, just as those kernels of wheat must finally be separated from the chaff, so also, God’s people must likewise go through a very similar separation process. You see, right now, at this very time in history, God’s great harvest is just now beginning. And now it is the time for His precious wheat to be separated from their housing. Here is revealed that the time of harvest is very much connected with the Valley of Decision. And right now, the human race is entering into that great moment of decision! Well, just as the harvest-time winds began to blow, so also, the winds of strife and confusion are now beginning to blow! Yes, we are living in the very time in which great turbulence, political, social, and religious strife are now intensifying on a pandemic level! And even in the church-world, various ideologies and “every wind of doctrine” are blowing from every direction! Now God’s Elect and chosen ones cannot be tossed about by every wind of doctrine. And yet, those things in the church-world that can be shaken, will be shaken, and soon taken away in those winds of confusion and strife! But God’s true worshipers will remain steadfast! In this way, the wheat will be separated from its housing. And so, it should be no surprise that all around us, we will sadly watch our housing fall away. Yes, the various churches and denominations will be carried away by every wind of false doctrines. But the end result will be a separated, but a purified Church. Our housing will have all been blown away by all the false doctrines which the apostate portion of the Church clung to. And all those who refused to separate from the housing, will be blown away in those winds of strife and confusion! But the glorious aspect to all this is that God will have finally purified His Church from all defilement. And like a mighty army, God’s Church will stand, as a witness to all the onlooking world! Well, these “four winds” have more meaning than this little devotional can speak of. THE READER IS INVITED AND HIGHLY ENCOURAGED TO SCROLL DOWN AND LISTEN TO THE AUDIO READING OF A CHAPTER, “FIRST THE BLADE, THEN THE EAR”, FROM ELLEN WHITE’S BOOK ON THE PARABLES OF JESUS, “CHRIST’S OBJECT LESSONS”. 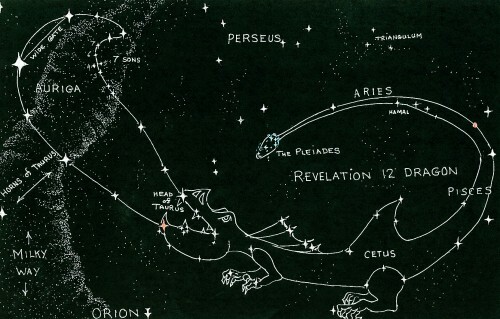 THE DRAGON of REVELATION 12 CONSTELLATION . The Dragon Cons tellation can be located by finding Orion in winter months. 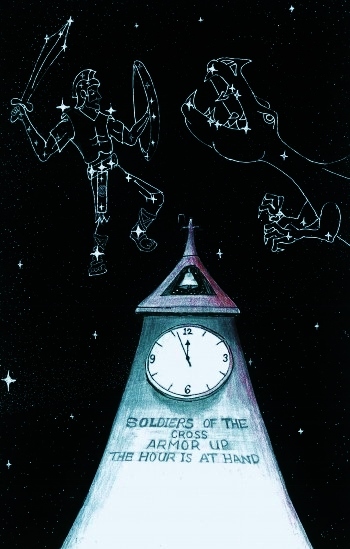 The Dragon is to Orion’s left, and the Dragon’s mouth is right next to Orion’s shield. This Dragon’s mouth is the V-like constellation The Hyades Cluster, which is the very same constellation that comprises the head of Taurus the Bull. In other words, Hyades is also known as the head of Taurus the Bull. And Hyades is the mouth of this Dragon.